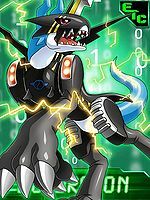 An Armor-level Beast Digimon that evolved through the power of the "Digimental of Friendship". 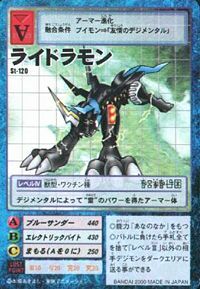 The "Digimental of Friendship" has the attribute of "Thunder", and those that don this Digimental fight against their enemies with nimble movements like lightning piercing the ground, and defeat them with electric-based techniques. Its Special Moves are firing an electric blade from the lightning-bearing blade on its head (Lightning Blade), and unleashing a powerful electric shock from the three protuberances on its back (Blue Thunder). 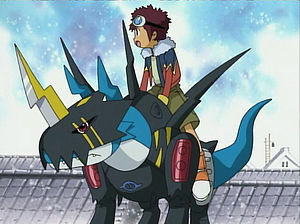 A Beast Digimon that evolved due to the Digimental of Friendship. 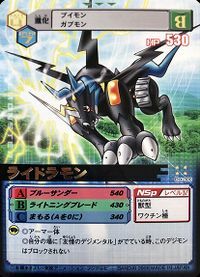 Special Moves — Fires an electric blade from the blade on its head (Lightning Blade), and unleashes a powerful electric shock from the three horns on its back (Blue Thunder). 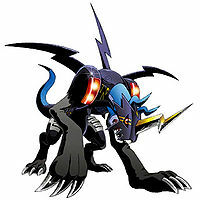 A Beast Digimon with lightning-like horns that Armor evolved from V-mon with the Digimental of Friendship. It excels in agility, and is able to race across the land as though it is flying, carrying its Partner on its back. Its Special Move is unleashing a powerful lightning strike (Lightning Blade). 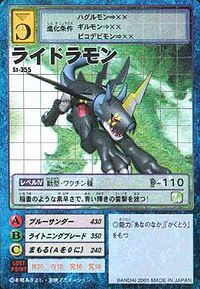 A Beast Digimon that fights against its enemies with nimble movements like soaring lightning. Its Special Moves are "Lightning Blade" and "Blue Thunder". — Digimon Adventure 02: "Blue Lightning, Lighdramon"
Title: 「轟く友情」 — "Thundering Friendship"
Anime/Manga Digimon Adventure 02: "Blue Lightning, Lighdramon"
Blue Thunder  ブルーサンダー Burū Sandā Thunder Blast/Lightning Blast Strikes with bolts of lightning from the spikes on its back. Lightning Blade  ライトニングブレード Raitoningu Burēdo Thunder Blast/Lightning Blade Fires an electric blade from the blade on its head. Electric Bite  エレクトリックバイト Erekutorikku Baito Electric Byte An electrifying bite attack. Thunderbolt  サンダーボルト Sandāboruto Thunder Blast Fires bullets of electricity from its mouth. Lighdramon is the partner of Motomiya Daisuke. He evolves from V-mon when Daisuke uses the Digimental of Friendship. 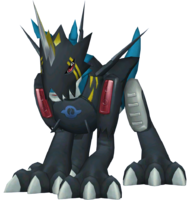 Lighdramon is a secret, obtainable digimon, but is at the Perfect level. 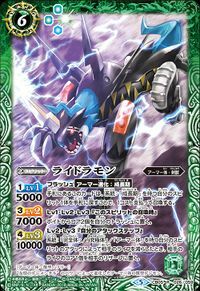 It evolves from Fladramon with 6+ DP, and can further evolve into Hououmon if its DP is 0-7, or Imperialdramon if it is above 8. May evolve from V-mon if level 11 or more with Digimental of Friendship. 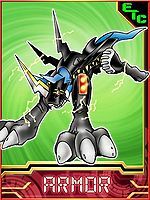 Lighdramon is only obtainable as a collectible card. 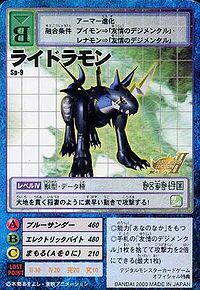 Its card is part of the Digimental of Friendship (友情のデジメンタル Yūjō no Dejimentaru) set. Lighdramon is available as a Digimon Medal. 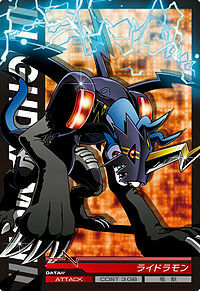 Evolves from V-mon with the Digimental of Friendship, and is one of the playable Partner Digimon. This Armor level Digimon gains the power of thunder through the Digimental. It shoots out a dazzling blue thunderbolt at the speed of lightning! High-pressure electric current flows through its jaws! Just one bite from it immediately electrocutes the enemy!! It attacks with lightning-speed and pierces the earth! 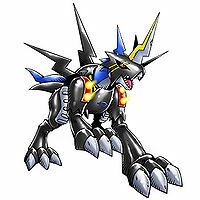 The form V-mon took on after Armor evolving with the Digimental of Friendship. Carrying the element of thunder, it charges towards the enemy at lightning-speed and attacks with its electric techniques. 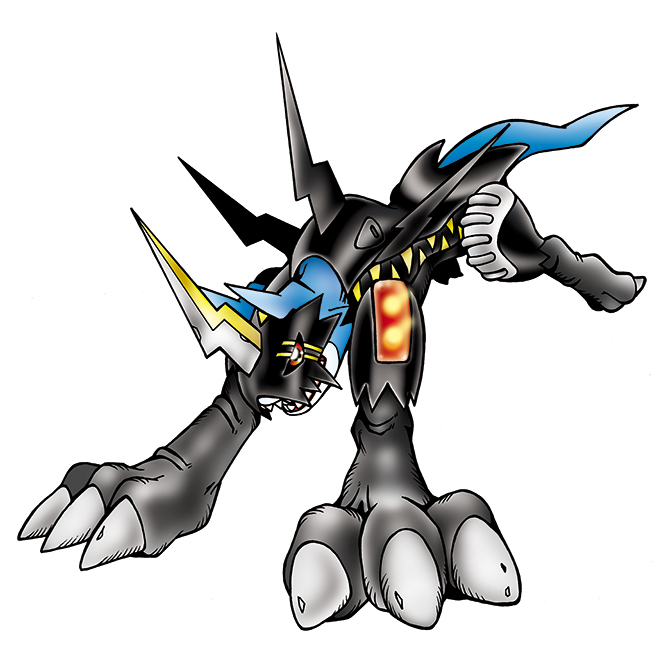 An Armor-level Beast Digimon that evolved through the power of the "Digimental of Friendship". 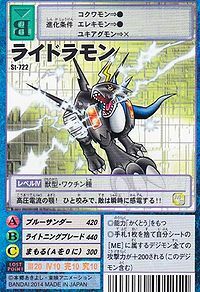 ↑ Digimon Adventure 02: "Blue Lightning, Lighdramon"
This page was last modified on 18 March 2019, at 22:03.